Feedback from multiple sources ensures that faculty are not disillusioning themselves with misguided opinions on their strengths and weaknesses. Damien Wilpitz joins me this week for a co-written article on the practice of 360-degree and reverse reviews, and their noticeable absence from academic labs. Damien is a laboratory research manager at Brigham and Women’s Hospital in Boston, and a research-management consultant. Jonathan: We just completed our 360/reverse review at Platelet BioGenesis. This is a yearly exercise in which our board of directors sits down with our team to review the organization’s executive. The board drives discussion and collects the team’s impressions, critiques and suggestions, which are then consolidated and communicated anonymously to the executive. The goal is to identify gaps in our management and address issues that the executive is unable to see or does not experience because of their perspective, and would be uncomfortable or inappropriate for team members to communicate to the executive directly. This feedback, while always difficult to hear, comes hand-in-hand with recommendations on best practices and good corporate governance from our board, which is made up of experienced managers that have been through the same challenges before in various iterations. Because the board members are not company employees, they have a vantage point that is different from the team. I’m sharing this experience because reviews are always difficult conversations to have. No one ever likes to reflect on where they are falling short, and feedback sessions can sometimes feel like trials by fire rather than fireside conversations. But that is exactly the point. This kind of “stop-action” play is necessary to interrupt the usual barriers to feedback on performance. To our credit (and culture), our team members are committed participants, our board members are clear communicators and engaged moderators, and our executives are receptive to feedback and motivated to improve – which has made this a positive process. The outcome is a better company and the experience is renewing; cleansing even, since it allows all of us to get the big issues off our chests, enabling us to come out of it better than we went in. 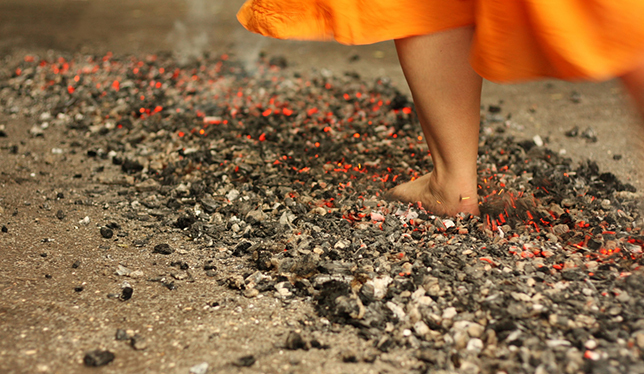 Like the act of walking barefoot over a bed of hot stones, the experience has served a further socializing function for us by promoting social cohesion and team-building through the alignment of emotional states. It has strengthened group dynamics and helped forge a common identity amongst participants. 360/reverse reviews are so effective that they are all but commonplace in industry – which begs the question: Why do we not employ the practice in academia? Damien: Historically, academic centers are based on old review processes that credit individualistic merits. However, independent investigators labs comprise a diverse group of trainees and support personnel: postdocs, graduate and undergraduate students, technicians and administrators. Some of the inherent issues that plague academic research teams — like interpersonal conflicts, low morale, poor benefits, pay gaps or limited career/personal development — can be alleviated by better leadership training. This personnel dynamic is comparable to that of startup biotech. Unfortunately, leadership communication is where academia and startups differ. Startup CEOs and managers have taken a page from the broader industry of leadership development and have benefitted by recruiting better talent, securing more financial awards or investors, and receiving better peer and public recognition. I believe that academia can stand to learn from this. There are all sorts of faculty rating systems already in the academic sphere: tenure peer reviews, professor ratings and even seminar-speaking reviews. Yet, there are very few times when research faculty are subjected to a critical 360/reverse review process, from which they can also benefit. In our consulting practice, we often deploy these tools with younger faculty to get them used to the idea that they should often solicit and welcome this sort of review. It’s a way of ensuring that they’re not disillusioning themselves with misguided opinions on their strengths and weaknesses. It’s instant feedback that allows them to adjust their behaviour before poor leadership habits can settle in. It also can help to decrease imposter syndrome, which often plagues young faculty. What we have found is that faculty that participate in this process are more creative and open to learning new techniques for developing their communication with trainees. 360/reverse reviews are often a way for leaders (regardless of setting) to become more self-aware, an important leadership skill that helps to ensure a more dynamic and strengthened research team. Injecting it into academic culture is essential if we hope to improve how academic labs are run.